Alabama Day Hikers has invited you all to attend!! Please either contact Esther at roamschool@gmail.com or check the Alabama Day Hikers Facebook page for any updates and join the event posting. Every year people across the US climb to their state's highest point and take a photo with a banner to honor officers in their state who have fallen in the line of duty in the past year. Alabama has never had anyone to represent our state, so for the past 2 years, we have gone as a family with the banner to participate in honor of a friend in Arizona who has been an officer for 20 years and our own son, who wants to serve as an officer when he's older. 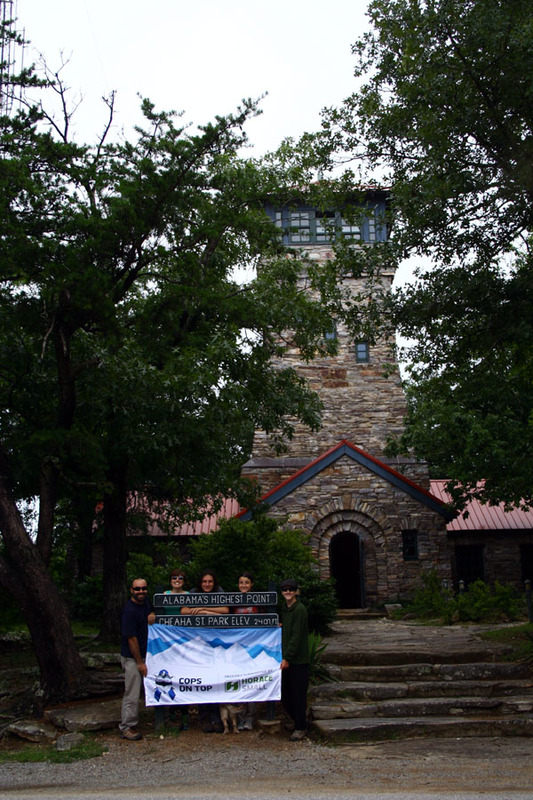 We will meet at the tower at the state park at 11 and let's have a picnic lunch together and anyone interested can play on the playground or climb on the rocks. We will do the photo around noon to give everyone a chance to get there. Afterward, we can walk to Bald Rock and enjoy the views, then anyone interested can join us for a hike and swim at Devil's Den Falls that afternoon. I hope we can get lots of folks this year! Let's not turn this into any type of police-bashing forum, I know there are people who don't like the government and the past year actions taken by some officers have stirred ill will. If you want to join us for the day but don't want to be in the support photo, simply stand aside when we pull out the banner for the shot. Start at 11 a.m. 19644 Hwy 281 Delta, AL 36258 (Cheaha State Park) $3 per person state park entry fee.